School is out and summer is calling to you. 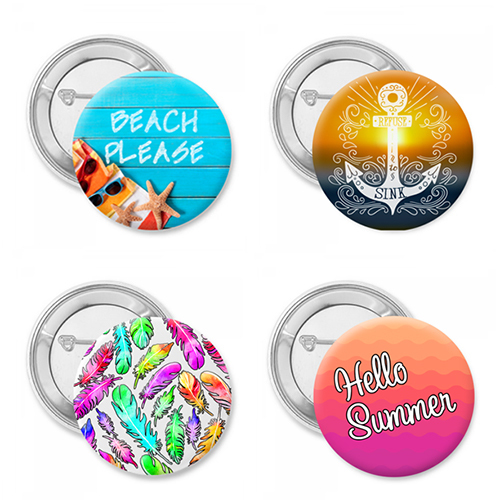 Say Hello to summer with this 4 pack button set. Features a Beach Please, nautical anchor, Hello Summer and a rainbow of feathers. Attach to your beach bag and set the trend while getting a tan. Sizes: 1.25", 2.25" or 3"
Do you love summer? Put on your bikini, grab your beach bag and hit the sand with this 4 pack of Summer Love buttons pinned to your hat or your beach bag. Each button comes in your choice of size and has a pin backing. Order a set for yourself and one for a friend and get your tan going.